With a 20 year production run, Ducati's overhead camshaft singles established Ducati's current reputation for building exceptional sporting motorcycles. The overhead camshaft single provided the DNA for Ducati motorcycles but with little accurate documentation and information available before now they can be difficult to restore and authenticate. 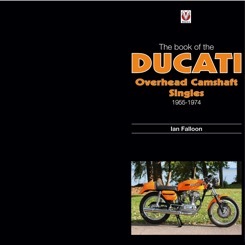 This is the first book to provide an authoritative description of the complete range of Ducati OHC singles. When Fabio Taglioni designed his 100cc Gran Sport Marianna back in 1954, it was unlikely he expected this engine to have such a long and lingering influence on Ducati design. Over the next 20 years, the single was developed into a myriad of different types, in capacities up to 436cc, and was the first production engine to utilise desmodromic valves. Incorporating features that continue to this day, the overhead camshaft single would become one of the most important designs in Ducati history. Years of research have resulted in this, the first book to document in detail all the types of Ducati overhead valve singles, making this book an invaluable resource to the collector, restorer, and enthusiasts of these magnificent motorcycles.